The launch date for a United Launch Alliance Delta IV carrying the WGS-9 satellite for the U.S. Air Force is no earlier than March 14. The team is actively working to resolve a Delta IV first stage booster issue discovered during standard prelaunch inspections. This additional time will allow the ULA team to ensure all systems are operating nominally prior to launch. A new launch date will be released once it is established. The Delta IV will lift off from Space Launch Complex-37 at Cape Canaveral Air Force Station in Florida. 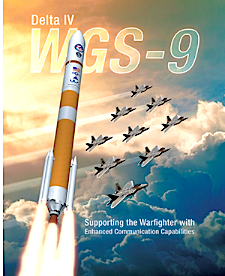 Launch Notes: WGS-9 will mark the seventh flight of the Delta IV in the Medium + (5,4)configuration; all launches in this configuration have delivered WGS missions to orbit. This mission also will be the 35th launch of the Delta IV since its inaugural launch in 2002. This mission involves the WGS satellite. WGS satellites are important elements of a new high-capacity satellite communications system providing enhanced communications capabilities to the troops in the field. WGS has 19 independent coverage areas, 18 of which can be positioned throughout its field-of-view. This includes eight steerable/shapeable X-band beams formed by separate transmit/receive phased arrays; 10 Ka-band beams served by independently steerable diplexed antennas; and one transmit/receive X-band Earth-coverage beam. WGS can tailor coverage areas and connect X-band and Ka-band users anywhere within its field-of-view. The X-band phased array antenna enables anti-jam functionality without sacrificing performance. Previously, on Boeing’s [NYSE: BA] eighth Wideband Global SATCOM (WGS) satellite communications bandwidth was nearly doubled compared to previous WGS satellites due to an upgraded digital payload. Using leading commercial digital circuit technology, the upgraded satellite aids in fulfilling the increasing demand for high-data rate communications of warfighters around the globe and doubled the satellite’s bandwidth. Boeing's improvements to its satellite products include increasing bandwidth and capacity, incorporating independently steerable and shapeable beams that can point bandwidth to where it’s most needed, deploying the world’s first all-electric propulsion satellites, and stacking and launching together two satellites. Boeing developed the channelizer that divides uplinks bandwidth into 1,900 sub-channels, providing more routes of communications for transmission. The new channelizer will also be included on WGS-10, at a cost of approximately $340 million. Boeing is on contract for a total of 10 WGS satellites. 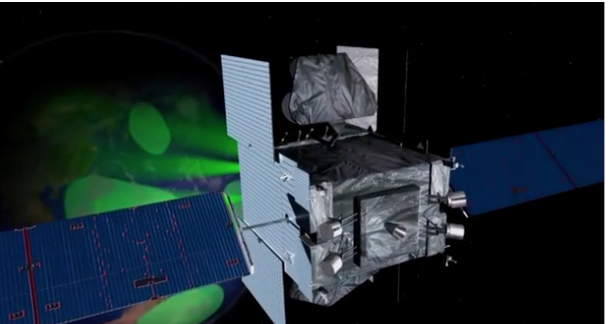 The WGS-9 satellite is funded through an international partnership between the United States and Canada, Denmark, Luxembourg, The Netherlands and New Zealand.